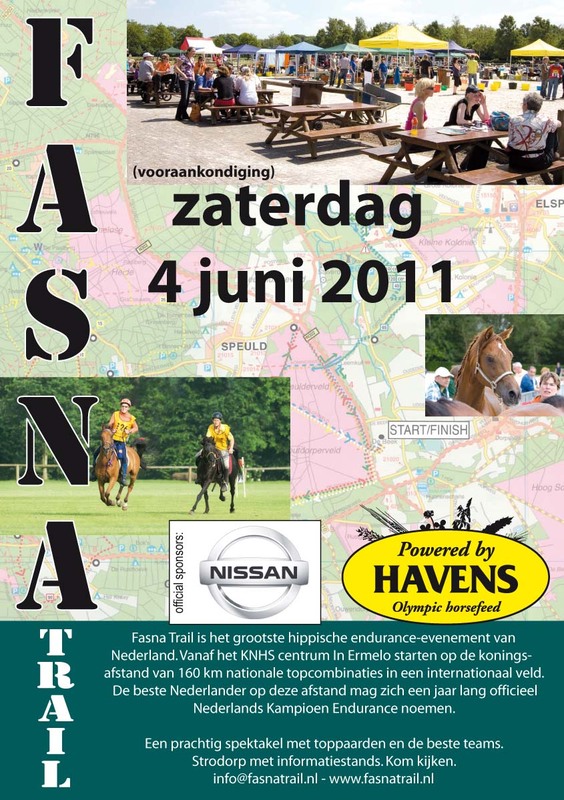 The Dutch Championships have returned to the Fasna Trail on 3-5 June 2011. Multiple rides will take place on 4 June: a CEI3* 160km, a 141km CEI3*, a CEI*2 120 km, a CEI2* Young Rider 120km, a 90km CEI, and a CEI* 90 km Young Rider. "In 2010 there was no Dutch Champion in the 160km Endurance, due to a lack of endurance sport in the Netherlands," says Eric Lamsma, Ride Organizer. "However, the organization has worked hard to be the only Dutch CEI to get back on the map. And successfully. Many new sponsors are supporting us, as well as Havens and Nissan. "Havens and Nissan also had the confidence in us last year which laid the foundation for 2011." There are still opportunities to support the event. The Fasna Trail organization intends to also link a CEI-O to the event. The first International participants have already reported. Harald Grinschgl has also committed to the 2011 Fasna Trail to record the timing information.